The Sunreef 58 Blue Desert was manufactured in response to a request for a light and exclusive sailing catamaran designated for long cruises with or without crew. Built in high-tech composite materials via vacuum infusion, like her predecessor, the Sunreef 58 Summerfield, the Sunreef 58 Blue Desert is a luxury and performance boat that comfortably sleeps 8 guests accommodated in 4 cabins with an additional cabin for a crew if it is needed. The main deck includes the cockpit consisting of comfortable couches, mattresses, a dining table, a coffee table and an ice maker. The cockpit is directly connected with an impressive saloon, which you enter through sliding doors. A recreation - tv zone and a dining area are situated in the saloon where the owners may enjoy time with their guests during a meal. The galley is located in the hulls, resembling the one found on the Sunreef 60 Loft Meri II, but has some unique modifications. With the saloon space slightly reduced, an additional worktable with a sink and underneath cabinets as well as additional kitchen appliances was installed. 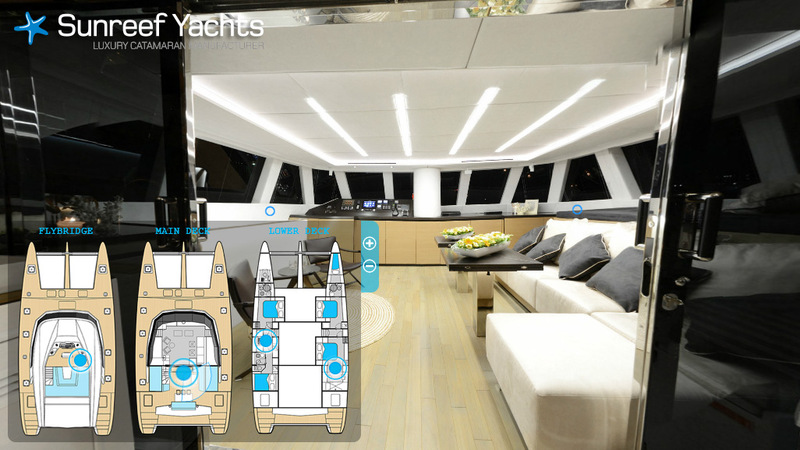 Like in the Sunreef 60 Loft Meri II, the galley is separated from the saloon with a “magic glass” wall. “Magic glass” is 90% transparent when turned on, and has a frosted aspect when it is turned off, providing privacy. The Owner's suite and guest cabins are located in both hulls. Each cabin has a comfortable double bed, extra cabinets and a high-quality Samsung or LG TV with Bose or Sonos audio. Additionally, every cabin has an en-suite bathroom to provide guests with even more privacy. In the master cabin the “magic glass” system has also been used. This time to separate the bathroom from the sleeping area. The guest cabins situated in the left hull have sliding beds that can be modified in various ways (a double bed or 2 single beds). Sand color is the dominant color of Blue Desert's interiors. Beds and sofas are covered with beige and brown upholstery made from alcantara, perfectly matching with grey - white and beige accessories. The bright accents in the saloon are set off by black elements, which makes it look very elegant. The entire surface is covered with the highest quality exclusive teak. As the owner emphasized the importance of the yacht’s sound system, upon his request, water-resistant high-quality Bose speakers were installed in the cockpit and on the flybridge. Blue Desert is a following unit that just proves the undisputed leadership of Sunreef Yachts in creating "custom" units. Every detail of this yacht was entirely prepared according to the individual wishes of the owner, who, just after the launch in August 2014, is now on his way to the Cannes Festival Yachting to present the catamaran at the shipyard's stand.